This article was contributed by a professional mixed martial artist. 3 Not Sure What I’m Talking About? Yep. A mere vitamin seems like an unlikely candidate to stop a chronic infection such as staph or even MRSA, especially when antibiotics failed. Yet this natural remedy worked for me. I had recurring chronic staph infection for over a year. It sounds like something dirty, but it is a common problem in gyms in Thailand because of the heat. If you train in Thailand for long enough you will probably come up against this beast of an infection at some point. I can barely remember when it started. But I took nearly 20 courses of antibiotics in that time and visited hospitals numerous times on 3 different continents. I had blood tests which all came back normal. I tried numerous types of antibiotics. I tried many herbs & supplements. I tried a change in diet. I tried positive thinking. Nothing worked. It came back time and time again. It got to the point that I was very depressed because my gut flora was a mess from the frequency of the antibiotics, yet I had to take them because of the consequences of not doing so (e.g. possible amputations or death!). I came across this study in my quest for a cure. I can’t tell you how many hours of research I put into this (it was many) over the year until I found this study. I ordered some Niacinamide and the next time I got Staph I took it at a high dose (1g 3x a day – so 3g total) alongside my antibiotics until it cleared and then tapered it down over 3 months or so. I continue to take 500mg a day for prevention. For me, Vitamin B3 (and in particular Niacinamide) was a magic bullet. I haven’t had Staph infection ever since (it’s been about 18 months now!). If this story sounds familiar, I recommend you to try Vitamin B3. I recommend Niacinamide over Niacin, as although both are Vitamin B3, the study and the type of Vitamin B3 I used was Niacinamide. In case you were wondering which brand I used, it was this one. Maybe plain Niacin will work too, but I’m not sure, and I also know that Niacin provides red flushing side effects in many people. I also found Tea tree oil fairly effective when applied topically to smaller wounds, but I figured this was more of a treatment for the symptoms rather than working on the root cause. If you use tea tree oil topically, be sure to dilute it and/or wash it off afterwards as it can be quite harsh on your skin. The phrase staph infection is usually used somewhat vaguely to describe staphylococcus bacteria. When it is a skin infection, it’s called cellulitis, but if it enters deeper layers under the skin, it’s referred to as fasciitis and involves bone, muscle, and other tissue beneath the skin. It’s important to note that staph is present all over the human body and is actually part of your normal skin flora, and there is plenty of it on your skin. In combat sports, an open wound combined with sweat and an active infection opens the risk of transferring staph from one fighter to another. The moist, warm environment that during our sport and around our training is a breeding ground for staph. Not only does it transfer skin-to-skin, but from the other equipment, mats, and pads used in training and in competition. In its simplest form, staph often like a skin rash. As long as immediate treatment with a topical antibiotic is used, this simple staph infection will go away within a week give or take a few days. When the infection goes beneath the skin, it becomes a challenge to treat and heal. The deeper it goes, the more difficult it becomes to treat and heal, which often results in lancing the wound after it forms a pocket. Sometimes, even after this is done, it can resolve in a week more or less. The issue isn’t in the treatment, but in how resistant the various strains of staphylococcus are in some cases. At this point, it’s called a super bug, or methicillin-resistant staphylococcus aureus (MRSA), which is a much bigger concern. Why? 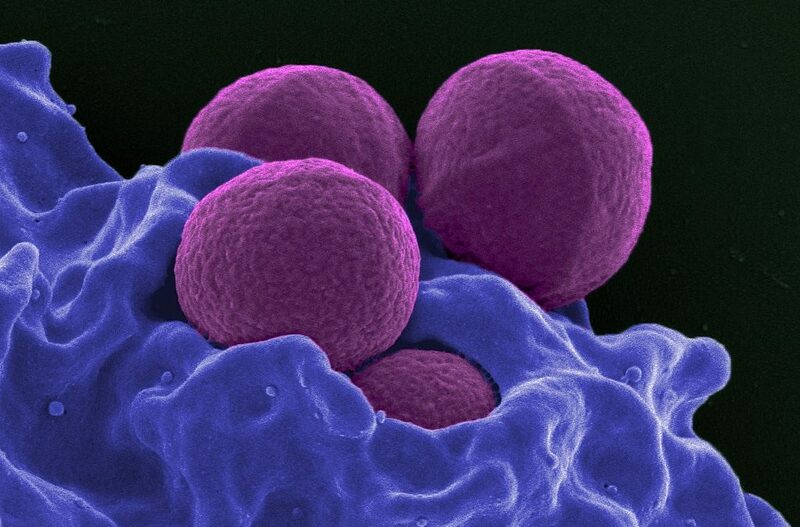 MRSA infections get out of hand fast, as does the ability for doctors to treat it. Once it comes to using IV antibiotics to provide a regular, high concentration of antibodies, it can be hit or miss as far as healing is concerned. Fighters (especially MMA) are susceptible to this and often wind up in the hospital when they ignore what seems like a minor rash, or cut. Due to the nature of staph at this level, the body’s immune system is overworked causing the infection to spread more quickly. Staph, left untreated at its simple form, will form an abscess, or a “pocket”. The acidity (pH) of the pocket varies substantially from the normal levels of the surrounding tissues. Most antibiotics won’t work in such an acidic environment. That’s why the “pocket” has to be lanced (opened up) and drained to get rid of the acid. Then the antibiotics can do their job, as can the body’s natural antibodies present in the immune system. If this kind of infection spreads to the bloodstream, it’s renamed bacteremia. 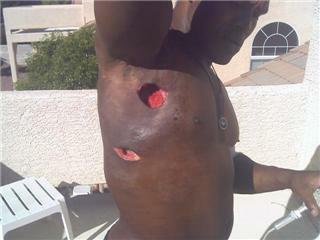 At this level, staph is starting to destroy flesh and tissue. If treatment cannot resolve it, the tissue or limb affected often has to be removed to save the person. That’s why Perez lost his big left toe. You don’t always lose a limb, but it happens when there is no other recourse. Wow what pictures!!! Thanks for the info staph is spreading like crazy. Thank you very much for this! From training Muay Thai in Thailand I know all about Staph infection. It can be very dangerous if untreated and can spread through a gym very quickly. I have had staph 3 times now and each time I was prescribed antibiotics which have serious negative effects. Will be sharing this information with my fellow training partners! Yes please do share this info as it is not common knowledge. Hi, what’s the dosage per day of niacinamide you used? I’ve done a bit of research myself online and it seems the risk of serious side effects starts to appear at around 3g a day, so make sure your dose is lower than that (and consult your doctor first). For niacinamide, the max dose is 8 grams per day. Anything higher can be fatal. Some people report symptoms of nausea at around 4-5 grams per day and your own personal level should fall below your own personal nausea range. If you feel nauseous then cut back. so stay below your nausea level and stay below 8 grams per day for niacinamide. Niacin has no toxic level. Niacin causes a flush which is alarming and scary at first. The flush gradually abates over the course of 1 week to ten days of continual use. It is better to take niacin with food or take with an aspirin to ease the discomfort of the flush. Niacin lowers cholesterol. So do not take it on cholesterol lowering medications. Niacin is very safe for the liver, contrary to mainstream medical stupidity which says otherwise. Niacin will elevate your bilirubin levels so doctors are taught in school that this means that niacin is harmful to the liver. What they don’t tell you is that no one has ever shown signs of liver damage from having taken high doses of niacin for decades. If you have the ability to survive two days of niacin flush, niacin lowers your bad cholesterol and raises your good cholesterol. It is very safe and healthy to take. Oh yes, and it also does not cause jaundice. Another silly medical fallacy. Dr. Abram Hoffer was the world’s leading authority on niacin. Please read his work and overlook the common silly fallacies you commonly hear from most doctors who were all ignorantly trained on the subject. Orthomolecular doctors have used niacin in high doses regularly for over seventy years to treat a wide variety of illnesses without any issues. These are the medical doctors that you should be listening to. Dr. Andrew Saul is one you can read up on. Read Dr. Abram Hoffer for the real facts on niacin. Thanks for the great comment Marianne! However, I did edit it because of the attitude and hostility in your message. Please keep it respectful, we are all here to learn and improve our knowledge. …Just a real life experience, my son took 7 grams of niacinamide two days in a row and spent three days in the hospital flushing it all out of his system. Toxicity is real. More that 3 grams is the limit in my opinion. The back surgeon opened his stomach to repair disks in his lower back. The gastrologist assisting with the surgery accidentally cut an intestine while sewing my son ! He was sent home from the hospital with drainage tubes draining pus off his stomach he was not taught or instructed how to care for these drainage tube\’s . One doctor prescribed Bactrim to treat the MRSA even though he told her he was allergic to the drug sulfur Dah? I am deeply sorry to hear of your sons situation. You cannot rely on Medico’s to save your son, they are stuck in a bubble that they do not know how to see out of. * Also that the FDA and other regulating bodies like the Medical associations do not ALLOW them to see or look out of. There are cures for Staph, and especially MRSA. Do some research on MMS (which is sodium chorite) it is sold as ‘Master Mineral solution”. Go to this site and have a look at all the amazing testimonials from people who have been cured from Staph (lots of them MRSA – 18 in total!). It is not something that is approved by the Government, as it would wipe out many, many pharmaceuticals, therefore resulting in the Big Pharmaceutical giants losing billions of dollars. So this a cure for many things besides Staph. Please have a look at this link.. There are 18 testimonials of people who have healed from Staph /MRSA. This website is under the umbrella of a ‘church’ as that is the VERY clever way that Jim Humble and Mark Grenon devised… in order to be able to not be controlled by the Government, TGA, FDA, Big Pharma etc.. They are protected by Church Law and legislation, and you can have the right to find health through these two pioneering mean. Also look up Michelle Moore, she is a microbiologist who specialises in Staph. She has written a very comprehensive book on it. There are a number of essential oils that are available in the United States that your son can take internally. Also he should be on high doses of Garlic and of course the Niacinaminde as discussed here. You need to keep him on high quality spore based probiotics, lots of fresh, alkaline food, no sugar (definitely no alchohol) and low complex carbs. There is hope.. I would order some MMS as soon as possible and start him off on the ‘starting protocol’ and then work up to ‘Protocol 1000’. Please do give it a try and spread the word. *also look up DMSO (Dimethylsulfoxide) also an AMAZING natural product, that can work together to deliver the MMS around the body and also topically. Good Luck! Right now you need more than prayers! However prayers are with you and your son.. I am a Nigerian. I live in Warri. Pls, send me more detail info and treatment of staph and how to get the nianci-namide and vitamine B3. I will be grateful if your info can help us in warri. My daughter is suffering with a second (after only one week break) MRSA infection. Legs, angles, trunk region. We are very scared – seeing yet another doc tomorrow. What are the signs/symptoms of it affecting the bone?